A collaboration between 29 partners, the micro:bit is the BBC's most ambitious education initiative in 30 years, with an ambition to inspire digital creativity and develop a new generation of tech pioneers. And because I have no pay masters, I can say what I like about it! During it's development I was hopeful for the device, but my first impressions were poor. And, in many ways, they failed to live up to even these expectations. Kids in the target market (year 7 and above) usually have phones and computer access, where they have access to far more impressive development environments than the 25 lights, so why should the micro:bit excite them? The supplied cable is stupidly short. 15.5cm, to be exact. This won't reach from a desktop (or laptop) PC to anywhere usable, and it's too short to let the compass be used effectively. Make sure you ask IT to order cables at the same time you request your micro:bit. The Touch Develop language appears incomplete. e.g. 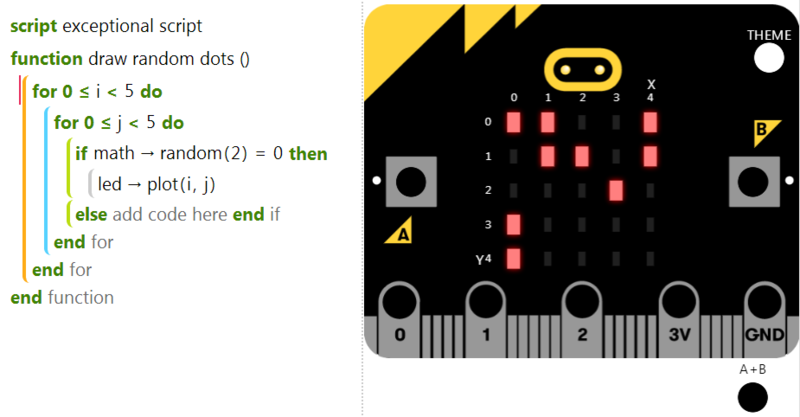 there's a way to tell the micro:bit to do stuff when a button is pressed... but not when it is released. The examples are little more than hand-holding exercises. There's very little in the way of creative thought, and even less in the way of opportunities to explore. I believe this is partly due to the 'by rote' method of teaching employed, and the (in)ability of the language and environment to foster this. However, it's not all bad. The program I wrote compiled, downloaded, and ran on the device the first time I tried it! 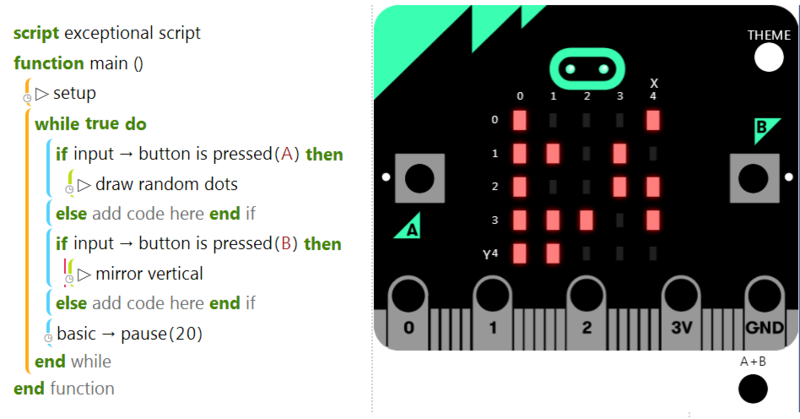 The micro:bit will start at the first instruction and continue to the end. This makes it very difficult to create animations, since the program needs to keep running in order to keep changing the animation frame. The reason for the delay is that the micro:bit runs so fast that without a pause any lights that blink would happen very fast, and could even cause epiletic fits in some users. But, to be fair, if your students are confident with the Arduino, they'll probably be teaching you how to convert it! Our first example is to create simple random pattern of lights. 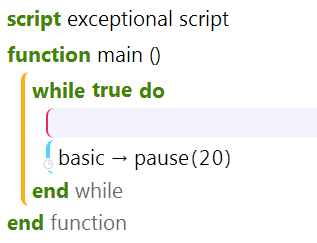 We will put this in a function on its own because we are going to use this code again, and it's good practice to isoalte commonly (and often)-used code in a function so it can be used time and time again. 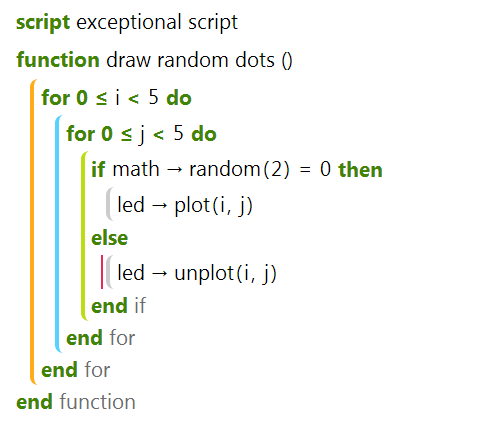 Notes: The random function is in-built, and returns a random value between 0 and 1. i.e. 2-1. Clear the screen when the user presses the button, but before drawing the new random dots. 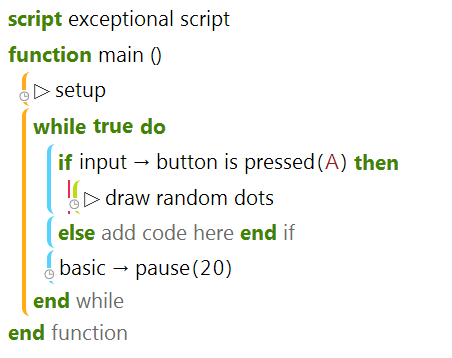 Amend the random dots function to include an unplot instruction in the else. 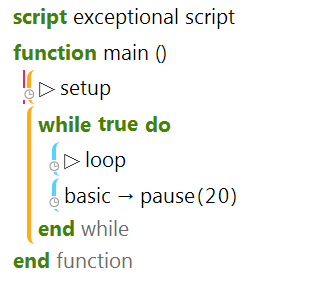 NOTE: The 'for' loops here repeat the inner code for all values of 0, 1, 2, 3, and 4. It is normal in programming to start counting from 0 and use < 5, rather than <=4 as it gives a clue as to how many items there are. In this case, 5. However, it is not normal to force the name of for loop counter. i and j don't make a lot of sense in this instance, since we're working through X and Y co-ordinates. Alas, I have not found a way to change this. Change the 'button is pressed' for 'on button pressed'. How does it behave differently? Is the while loop still needed? Why? Change the random pattern to be more (or less) dense. Use the led->set brightness function to randomly change the brightness. Then, write a new function which reads the state of each led, and produces a mirror image on the other half of the display. Remember to turn mirrordots LEDs both on, and off, as required. In short, don't bother! 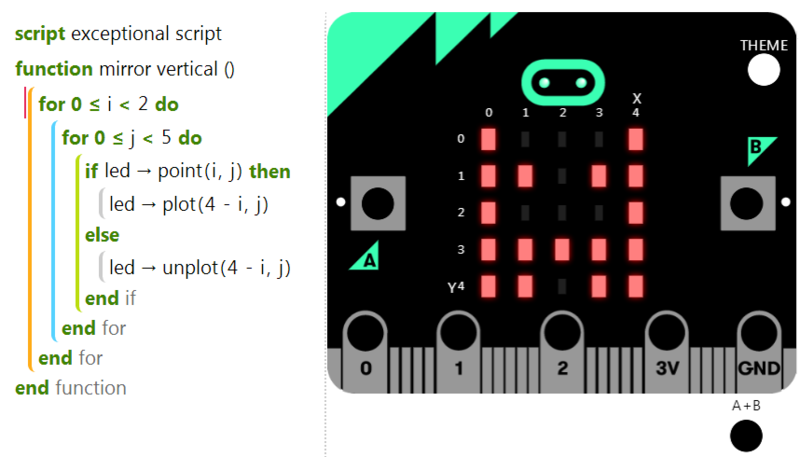 It appears the micro:bit requires you to re-configure the compass every time you upload a new program to it. This takes time, and causes anyone to lose interest! In short, don't bother! The temperature is detected by examing the ambient temperature of the circuit board. In doing so the temperature as reporting increases, or decreases, incrementally by 1 degree at a time. Consequently, all attempts at measuring a hot thing (coffee) compared to a cold thing (metal desk) took several minutes to reach a temperature different enough that it could be used.